The DejaVu fonts are a font family based on the Vera Fonts. Its purpose is to provide a wider range of characters while maintaining the original look and feel through the process of collaborative development (see authors), under a Free license. The current version is 2.37 (Changelog, Download). Bugs and requests can be filed in our Bugzilla at freedesktop.org. When requesting new characters please look them up on Unicode Charts and refer to their codes. Current and future work (with which everyone can help) is described on the Plans page. Send your questions to the dejavu-fonts mailing list. This list is also used for discussions and announcements. We have our own IRC channel on irc.freenode.org where you can ask all your questions to the developers: #dejavu. Join our team! We are always looking for more developers. The Developer’s Corner has more information for contributors. The GitHub project page can be found here. Next to that, DejaVu contains a lot of mathematical and other symbols, arrows, braille patterns, etc... Coverage of each font can be seen in PDF samples. 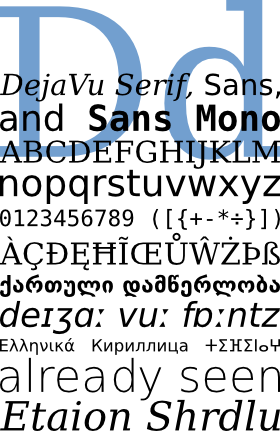 The derivative called DejaVu LGC covers only Latin, Greek and Cyrillic scripts.